In this edition of the SA parkrun newsletter, we welcome the newest event, Cannibal’s Cave parkrun while Kidd’s Beach parkrun turns one. 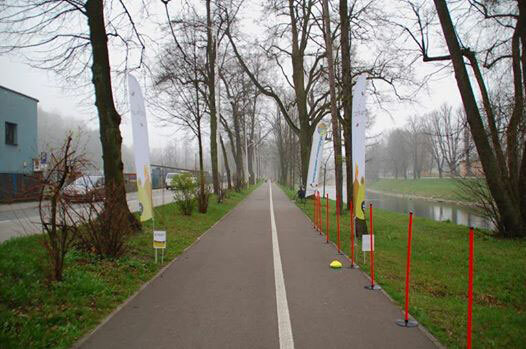 We take a tour of an international parkrun - in Poland. Stepping boldly forward parkrun SA has launched its first truly rural parkrun at Cannibal’s Cave! Before we have any more enquiries let me explain that the new parkrun is named after the cavern in the area where it was reported that desperate tribal refugees escaping King Shaka’s Mfecane were forced to resort to cannibalism to survive. Musi and Lizzie Mabaso have been keen to start a parkrun in their community and with wonderful help from Iain Morshead they finally launched the Cannibal’s Cave parkrun on the 28th June. Iain was the original event director of Ebotse parkrun, our 3rd ever parkrun. It is hard to think of a more spectacular setting for a parkrun than that of Cannibal’s cave. 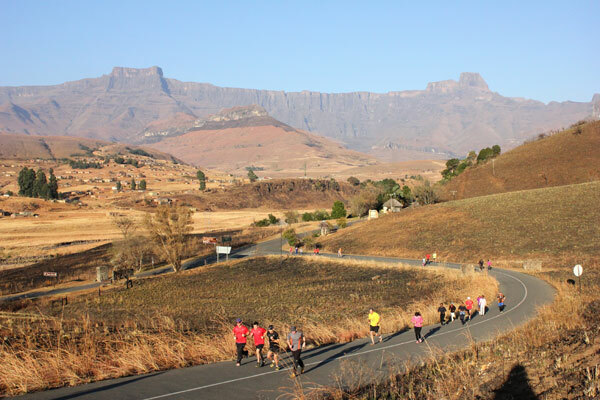 Running close to the Tugela River, in the Rugged Glen Nature Reserve runners are treated to magnificent views of the Amphitheatre and Sentinel mountains of the Drakensberg. The inaugural run was well supported by parkrun visitors and the word is spreading in the local community that parkrun has come to the mountains. While Cannibal’s celebrated their first parkrun Kidd’s Beach celebrated their first birthday. By all accounts it was a very special morning. We all know that Kidd’s Beach had teething troubles but it is now a thriving and happy parkrun. Enormous thanks to Benji Gane and his team for all they have done. parkrun volunteers are often expected to perform beyond the call of duty but Root 44 had a particularly unusual problem when a storm knocked an old oak tree down across their route. 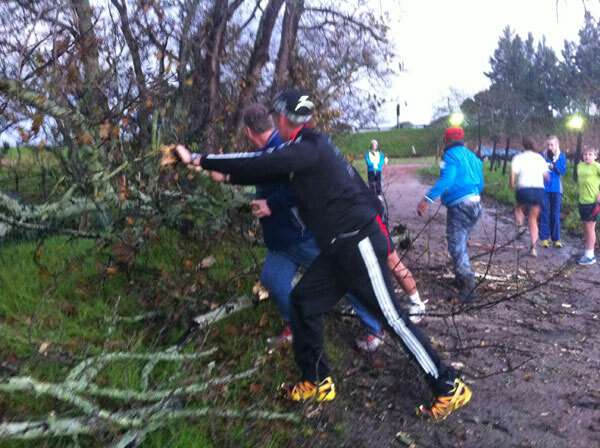 Volunteer Chris Visser got stuck in and cleared the tree together with JJ. International parkrun day is getting closer and we remind all parkrunners to keep the 4th October in mind. On that auspicious day 10 years ago 13 “parkrun pioneers” ran the very first parkrun. Little did they know that a decade later they would number well over a million strong. Where will we be in another decade? With that in mind parkrun is planning to publish a coffee table style book of all the best parkrun photos from around the World. South Africa has some spectacular parkruns and we hope to be well represented in the book. You will find the link to submit your photographs on your personal profile ‘Your Links’ Please submit only your absolute best photos!! You can learn from one of rugby’s greats as former England fly half and World Cup winner, Jonny Wilksinson, talks boots and all. Industry experts, Dr Craig Roberts and Dr Ross Tucker, will be talking about how science has influenced the way we train in terms of injury prevention and performance analysis. Prof. Ellen Langer, professor of psychology at Harvard University, will discuss how mindfulness significantly impacts personal health and wellbeing, business performance and leadership potential, and Stafford Maisie, former country manager of Google SA, will talk about the impact of health and wellness on technology. Dr Craig Nossel, Head of Vitality Wellness, and other industry experts will talk about the business of wellness. We’re also excited about the Big Fat Debate, with Prof. Tim Noakes. For more information, email or call 011 679 3344. Les was diagnosed with ovarian cancer 8 years ago. She had chemo every year subsequently and in the last 4 years the longest period she went without chemo treatment was 3 months. She was a fighter and vowed to fight and beat the disease. 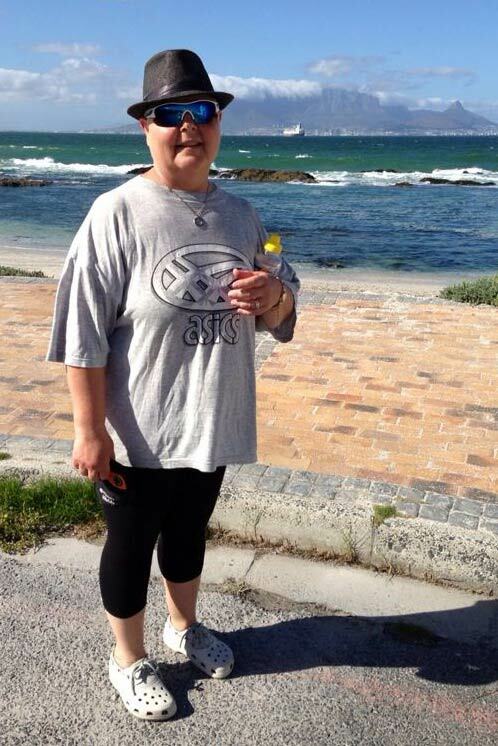 All she wanted from life was to have some quality of life, to complete the Argus Cycle Race and to be a little bit healthy and fit and do the parkruns. 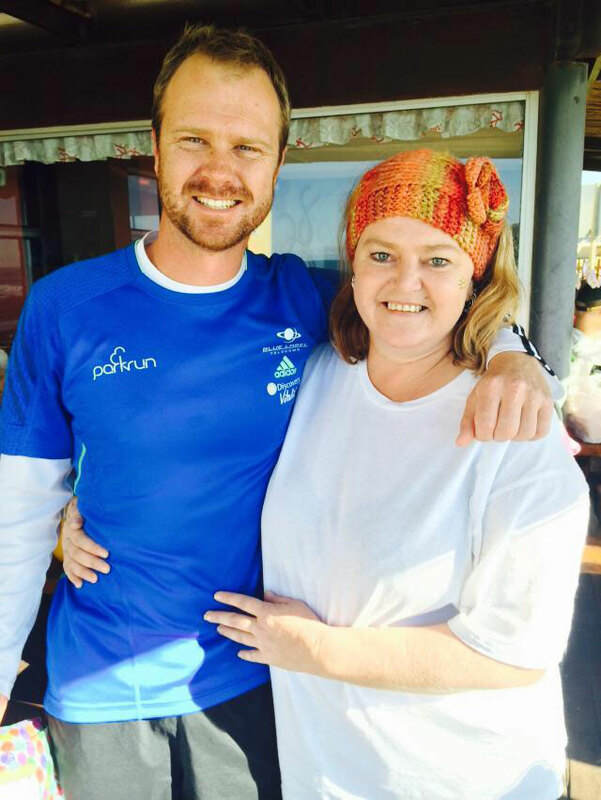 Les doing her one and only parkrun at Big Bay in Cape Town. It will be a day I will never forget. The July edition of our Media Partner, Modern Athlete Magazine is available online now! Subscribe to Modern Athlete here. If you have any trouble accessing your personal information page, please click here. We will celebrate the 10th birthday of parkrun on the 2nd October 2014. It will be exactly 10 years since the first ever parkrun took place when 13 runners met up for a blast around Bushy Park. In addition to this virtual party, we want to invite all parkrunners to get involved in this celebration by helping us to produce a permanent visual reminder of what we have achieved. Our plan is to produce a coffee table photo book totalling about 88 pages with hundreds of photos provided for the most part by you. Our aim is that every parkrun and every parkrunner will join us by celebrating this anniversary at their “home run” on the 4th of October 2014. We are hoping for a birthday celebration starting in New Zealand and following the sun until it culminates in the USA later that day. Family and Friends:- parkrun is made up of many different groups of people however one of the things that shines through is the coming together of families and friends. We are looking to highlight extraordinary examples of where this is the case. So, mothers who brought along their children and this has now grown to include grandparents or a work colleague who managed to get his whole team taking part on a regular basis etc. Changing Lives:- We know of many stories where peoples lives have been changed through their involvement with parkrun. Perhaps this is simply by losing weight but it could also be something more difficult to portray like overcoming depression etc. Making it Happen:- This category celebrates the volunteers without whom we wouldn't be considering this book. Four Corners of the World:- I have visited some stunning parkrun venues and I know of a host that are breathtaking. With this category we are looking to capture the essence of our vast geographical presence across the world. Perhaps it might be the image of parkrunners running down the beach in Nahoon Point with a whale flapping its tail in the distance or the sight of 30 parkrunners lining up on a snow frozen morning in Gdynia. You know best what images might portray our Four Corners of the World. Achievements:- Overcoming adversity or achieving something noteworthy. Just as parkrun stands for persistence and determination then this is not simply about speed. However, we also do not wish to ignore the achievements of the fast folks either. So, in conclusion, you get three chances to send us a photo to consider. Everyone has an equal chance of making it into the book. Take your time to consider the explanation that you will provide with the image as this will be an important contribution towards this historic book. If your image is chosen, we will credit you in the book however please accept that we may edit and/or crop your image in order to suit our needs.. Finally, this book is being produced by volunteers and there will be costs involved in producing the book. We are hoping to make a profit on the sale of these books which will all be put back into parkrun for the development of our Junior series. 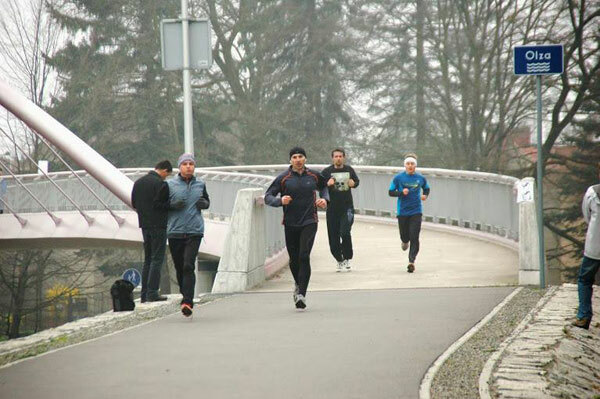 Cieszyn parkrun is one of the youngest parkrun events in Poland started only at the end of March 2014 and, at the same time, from the start has the privilege of being amongst the most unusual ones globally due to the location of its course. In order to bring closer the two local communities divided in 1920th after World War I the course that has been purposely designed in a way that it takes place in two countries. Although it starts and finishes in Poland, the course crosses over the state border River Olza and goes with nearly half of the route into the Czech Republic. Those wishing to run across the borders should definitely consider their participation at Cieszyn parkrun. Fortunately, runners from both sides of the river are not asked to show their passports when crossing the border however they use two languages for their pre-run briefing. You can probably guess what this is about: it is to tell you I have now done as many parkruns as you guys! That said, I am expecting Jaco, Jabulani, Rob and Tracey all to join the ranks very shortly. According to Andy Warhol, I can nevertheless enjoy 15 minutes of fame. I have to thank all the parkrun people that I met en route – it would otherwise have been meaningless. These include your 'average' parkrunner (Joe) who ran with me, those who shared a few words with me and made me welcome and the small number who let me pass them! Special thanks to all the volunteers (I must now start to do more myself) and the Event Directors (yea, even Hall’s) and naturally to the National Director and his good lady. We, as humans, are so quick to complain and are slow to give praise where praise is due, and also to say thank you. My husband and I normally run races in Pretoria and Johannesburg over weekends. We heard about the parkrun and joined Modderfontein Reserve parkrun a few weeks ago. We have run two parkruns and so enjoyed the experience. Besides the run in the reserve being a treat, the volunteers were efficient and helpful, with ready smiles. Just want to say a HUGE thank you to you and Gill for bringing this concept to South Africa for us all to enjoy. Your newsletter, the results after a run, the registration process are all so easy to read and to respond to. Three cheers for a brilliant concept and may this grow and grow and grow from strength to strength. My message is to let you know what parkrun means to me. I work at a very busy stressful job and battled to switch of, relax and enjoy my weekends. Since starting my first parkrun, I found that it somehow cleared my mind, energised me and just started my weekend on a high. I could not make a Saturday and just missed that great boost all weekend. I am not a great athlete but the run (to be honest - walk) has done wonders for my rheumatoid arthritis and gave stress a good old kick. Thank you to all the organisers, volunteers and sponsors and for the 500 Vitality points earned for every event. I just wanted to send a quick email because my family and I have recently come back from an amazing 3.5 week holiday in South Africa. Our primary reason for going was for my husband, Pete, to run the 89km Comrades race from Petermaritzberg to Durban, going to Kruger National Park, doing the Garden Route and spending 5 days in Cape Town. Our timing couldn't have been better - our holiday was spread over 3 Saturdays so we could try and find 3 Parkruns to participate in. Pete and I locally attend the Lake Ginninderra parkrun in the ACT (usually pushing our 1 and 3 year old boys). We haven't been able to go too frequently as Saturdays have been reserved for Pete's Comrades training, but now that has been completed - we are looking forward to becoming regulars! My mother-in-law & father-in-law also joined us in SA to watch Pete complete Comrades (which he did in am amazing time of 9 hours 38 minutes). My father-in-law runs the Lake Mac parkrun in Newcastle (he is a regular - there every week! ), so all 3 of us were keen to find local parkruns to attend. First Saturday in SA - we were in Durban and it was the day before Comrades. We arrived at the Casino foreshore to a swarm of people - it was an absolutely huge event, with so many people in town to run Comrades. The race was a nice & easy out and back along the beachfront, with a fantastic atmosphere with so many spectators. We were all happy with our times, and pretty excited to have participated in our first overseas parkrun - what an awesome buzz we felt! Our second Saturday in SA we were in Port Elizabeth. Again we turned up pretty excited, and the crowd seemed to be full of regulars. We identified ourselves as being from Australia, and people were so friendly to us and making us feel welcome. After the first 2 kms of running along the beachfront promenade, Pete and I looked at each other and couldn't work out where the front-runners were - usually by now we would have seen them turn around and come back. When we arrived at the 2.5km mark, we followed the crowd towards the beach and discovered with a lot of glee that the rest of this run would be along the beach! It was an awesome experience running along the sand and a great feeling watching so many parkrunners at the beach! This race was definitely a highlight for me - first in my age category - wahooo!! The final Saturday in SA (in Cape Town) was a cold and windy one, but we decided that we would regret it if we missed the Greenpoint parkrun, so off we went to find the start. We followed the instructions on the website, did the usual thing for a first-timer and arrived early, and started following some people who looked like parkrunners. We all stood around and started chatting, only to realise that everyone there were first-timers at Greenpoint and no one knew where the start was! Luckily a few minutes later one of the volunteers turned up and showed us where to start - and then 5 minutes before the start the regulars came to join us (they were much smarter than us as they waited in their warm cars right until the last minute!). This was a really fun race, as it is not simply an out and back, and you really need to pay attention to where you are going and the signs / volunteers out on the course. Luckily we didn't get lost and found our way to the finish line, where again our fellow parkrunners and volunteers were so welcoming of us. So all in all, we had a fabulous 3.5 weeks in SA - our parkrun experiences were most certainly one of the highlights of the trip. So thank you to SA for an amazing holiday and for hosting us over the 3 weeks - 3 very different runs all with the same amazing parkrun experience!